Louise Unsworth, business unit manager at Brother UK, explains how supplying genuine supplies is essential in fostering great relationships with customers, helping them to enhance security, reduce health risks and avoid unexpected costs. Each year, up to £2.25bn worth of counterfeit imaging supplies including toners, ink cartridges and ribbons are infiltrating the global supply chain. Companies think they are getting brand quality at a low price but, while it might appear so, this is a false economy and it is having wide-ranging negative effects. Third-party toner provides one of the greatest risks when it comes to reduced costs and downtime, as it can inflict damage to the drum and the fuser. Replacing a drum can cost around £100, and having to exchange a fuser will cost almost as much as buying a whole new printer. In this case it is better to take the safe option to avoid any nasty surprises. However, considerations should extend beyond just the cost of replacing hardware as the downtime could have a far greater impact upon overall business productivity, leading to many lost working hours. Downtime is a word that no business wants to hear, whether it’s the internet, phone-lines or printers. Each one of these can lead to a productivity loss, which can have an impact on the bottom line. Supplies designed by manufacturers for their hardware will work better than counterfeit or third-party alternatives, minimising the risk of faults or failure. This helps to reduce potential downtime and supports better business efficiencies. A large part of customers’ investment in their printer is in its print quality. Using genuine supplies is key to ensuring the printer performs to its maximum potential across a range of media and delivers on its promise. To put it simply: you get what you pay for. The risk and uncertainty around the quality rendered by third-party products is significant. Whereas, for genuine supplies, the engineering team that has designed the hardware has also developed the supplies, meaning they are finely tuned to work together. Brother OEM has a specific recipe per printer as different fusers melt toner at various temperatures. Third-party supplies will not be designed with this temperature in mind, so the toner will not adhere to the printed page. It’s much easier for the channel to ensure quality control by purchasing genuine supplies, which are specifically produced for the hardware. This way, each page printed should be just as good as the last – with bold colours and text that appears as finely as it does on a computer screen. In business environments particularly, quality printouts are an essential as poor rendering of a document that comes out smudged or blurred can completely undermine its excellence. Imagine an end-user printing a business proposal ahead of an important meeting, which took weeks to perfect, for it to be ruined by poor print quality. Or, what happens if factual data cannot be read properly due to the standard of print? It can have a significant impact on the operation and reputation of a business. This can be even more significant in certain sectors. In healthcare, for example, patients may be poor-of-sight, so bold text that’s easily readable is essential for all print-outs. In independent testing, Brother Genuine Supplies were found to provide a more consistent page yield, with a higher calibre of printing than any third-party alternatives. They are six times more consistent than non-genuine cartridges, with one brand of third-party toner producing printouts, which were judged to be poor quality 70 percent of the time. This means documents require reprinting, which in turn presents the end user with an additional cost. Third party cartridges also struggled on yields, in some cases they were shown to produce as little as half the number of pages per cartridge as genuine supplies. 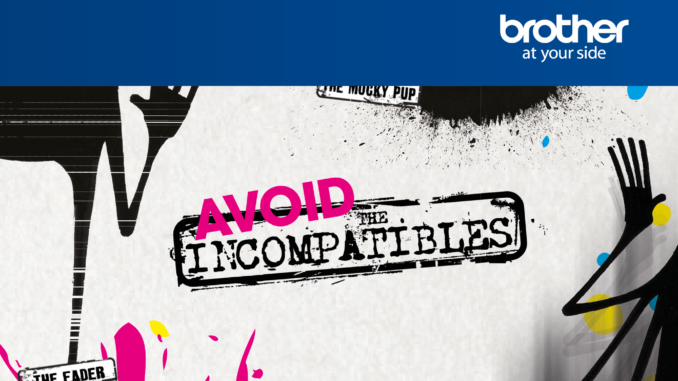 At Brother, we have ‘The Incompatibles’ campaign designed to highlight the common problems with print as a result of using third party supplies. We created five monster characters which embody the issues caused by using non-genuine supplies to help partners and customers understand the detrimental impact they can have. All of ‘The Incompatibles’ are based on research that compared Brother Genuine Supplies to third party products. In independent testing, not a single Brother cartridge was classified as low quality and our supplies were found to perform consistently better.